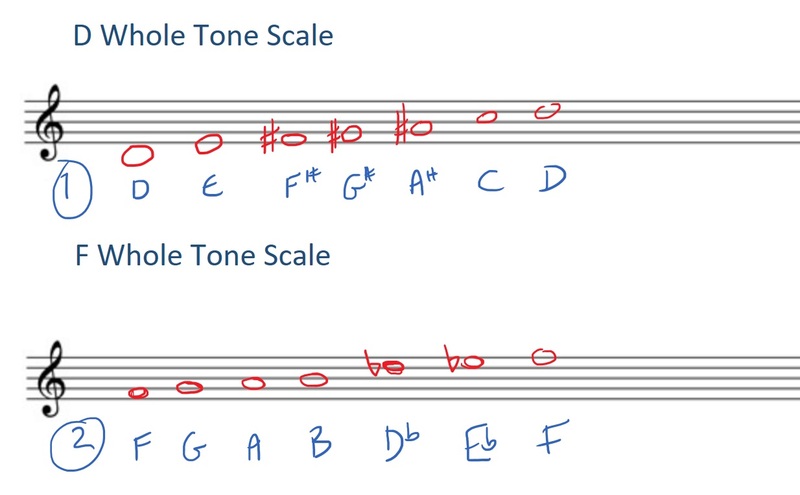 Whole tone scales are very easy to build and to understand, since they’re entirely built on whole tones. We’ll talk about what that means (it’s not complicated), do a few examples, and I’ll share with you a piece that’s written in a whole tone scale so you can get a sense of its weird and otherworldly sound. What is a whole tone? The first thing we need to figure out is what a whole tone is. On the piano, a half step (or half tone) is the shortest distance between two notes. So a C to a C# would be a half step, as would an E to an F. If there’s no other note between them, it’s a half step. Whole steps (or whole tones) are made up of two half steps. So C to D would be a whole step. E to F# would be a whole step. And so on. So when you’re playing a whole tone scale, it’s going to be a scale of nothing but whole steps. When we play regular scales, whether they be major or minor, they’re mainly built with whole steps, with a couple half steps thrown in to make it sound natural. I’ll play a regular D major scale on the piano. You can see it’s mainly whole steps, except for the notes that have sharps – that’s where we have half steps. Regular major scales have a simple, normal sound to our ears. Doesn’t it sound otherworldly, almost alien? Another weird thing about whole tone scales is that they only have 7 notes (all other regular 1-octave scales have 8). Technically they only have 6 original notes (the last note, a D in this case, is the same as the starting note). This is what a D whole tone scale looks like when it’s written out. One neat thing about whole tone scales is that there are only two versions of them. I’ll show you what I mean. The first version is the one that involves sharps, like our D major version. If I were to figure out the whole tone scale of C, it would be this exact same pattern of notes – only it would start on C. Same if I were to figure out the whole tone scale of F# – it would be the exact same set of notes, just with a different starting point. You could start on any other note of that scale – a G, an Eb – and it would be the exact same pattern. Neat, huh? Okay so now you understand how whole tone scales are built, and you understand that there’s really only two iterations of them. How do you play them? The biggest thing to remember is that you never want to put your thumb or pinkie (finger 1 or 5) on a black key. These are our short fingers, and the black keys are further away – so we want to use our longer middle fingers on them. So now that you know how to play them, it’s my job to inform you that you’ll seldom need to actually play whole tone scales. They’re not required for playing exams (that I know of). You need to understand the theory of them if you’re ever going to do written exams, but that’s about it. So whole tone scales aren’t something I practice, because most pieces I learn aren’t based on whole tone scales. However, if I was learning a whole tone piece, I might practice a whole tone scale to get a feel for it. So let’s get into the sound of whole tone scales. You already know they sound unusual and strange. Erasing all of the half steps takes away all stability for our ears – we can’t tell which tone is “home base”, so we never really feel anchored. Listening to whole tone music feels like floating through space. If you build chords out of a whole tone scale, you end up with augmented triads. An augmented chord is where you take a regular major chord and raise the 5th (the note on the end). They have a really disconcerting, unsettled sound to them. Guys like Bach and Mozart used whole tone scales in a couple pieces – but only for moments, before reverting back to regular tonality. Romantic Russian composers, like Glinka and Rimsky-Korsakov, took the concept even further. But where the whole tone scale really started appearing in compositions was during the Impressionist period, in the hands of composers like Debussy (who was influenced by the Russian Romantics). A great example I’d like you to take a listen to is called “Voiles” by Debussy, from his first book of Preludes. The title translates to “veils”, and they playing instruction translates roughly to “a caressing rhythm without rigor”. 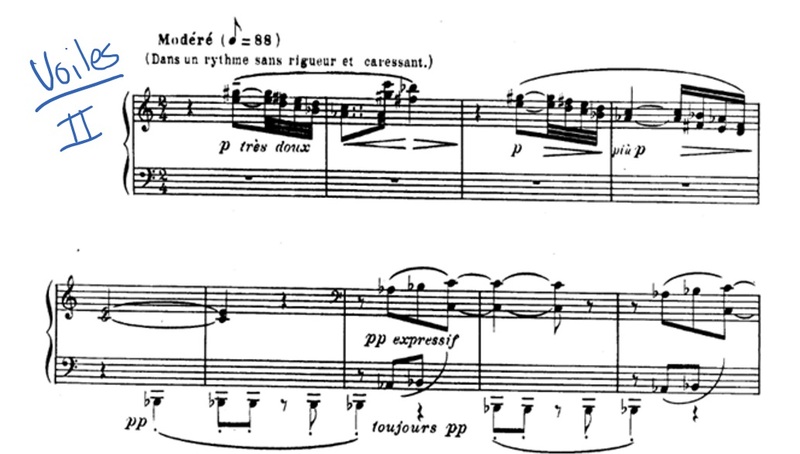 Basically Debussy wanted this to have a really floaty feel – this isn’t one to play with a metronome. Let’s take a quick listen. Outside of the Classical music landscape, whole tone scales can also be heard in Hindustani classical music (from India), as well as American jazz. Wayne Shorter’s song “Juju” is a great example of this – you can hear it right away in the introduction.